Hello again readers! It has been a busy semester for the IME cohort, and we are excited to share what's been happening with you. After completing our strategic planning for Lethbridge Therapeutic Riding Association in December, our attention shifted to our new classes, new ideas, new case challenges, and of course, the ideation of our community project fundraiser. As we worked through our curriculums for International Management, and Human Resource Management, we had the exciting opportunity to participate in the KPMG Case Competition. We formed new groups and worked to find solutions for the case we were given. Of the 11 teams registered in the competition, 3 of our teams made it into the top 6, and two teams advanced to the finals. Congratulations to our IME representatives for their amazing work and application of their knowledge! Our KPMG finalists: Carter, Keely, Reanne, Amber, Sarah, and Caleb. In early February, the IME class attended the annual Professional Development Program (PDP) Conference. This year, the theme was Boldly Communicate: Be a Better You. 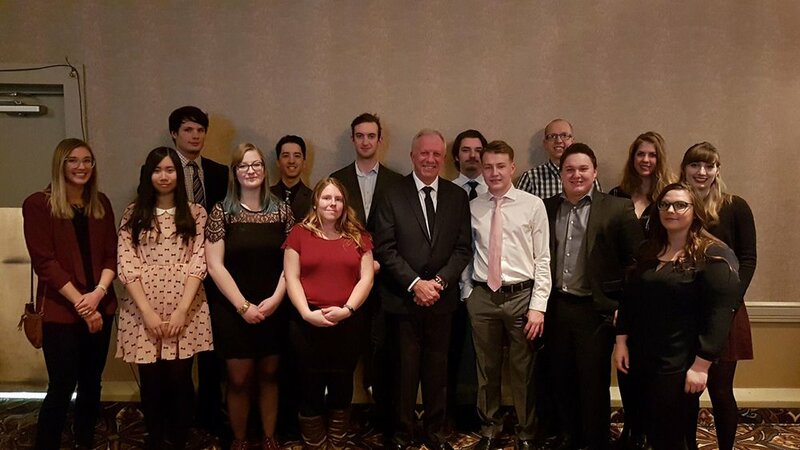 The first evening of the conference consisted of dinner, networking, and a fantastic keynote speech from Darby Allen, who led the initiatives to fight the wildfires in Fort McMurray in 2016. Allen mentioned the importance of leaders being able to listen more than they talk, as well as to pay attention to the little things that keep their teams functioning, such as a simple "good morning" each day, or refilling the coffee pot. It was a humbling speech, and an honour to be able to witness it. The second day of the PDP Conference consisted of breakfast, lunch, a keynote speech from U of L alumna, Angela Thompson, and workshops pertaining to running quality meetings, reading body language, and having crucial conversations. It was a great reminder of how much of an asset communication is, and how important it is to consistently grow those skills. The IME class pictured with Darby Allen. That's all for now! Stay tuned for more updates on the event as we work to finish the year strong!